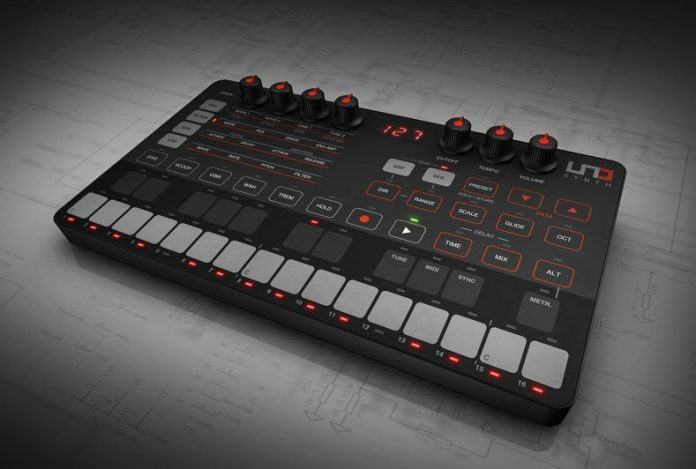 With analog synths making a huge comeback in music, film, and just about everywhere else, it’s nice to see IK Multimedia take a shot with UNO. This ultra-portable synth comes packed with all the great features of analog synth as well as battery powered for on-the-go applications. IK Multimedia proudly debuts its premier hardware synthesizer, UNO Synth. Designed for everyone interested in rich, true analog sound, this new monophonic synth offers a wide sound palette and easy programmability in an ultra-portable, battery-powered format for on-the-go music creation, live performance or studio recording – all at an affordable price. The UNO Synth’s generous 27-note onboard multi-touch keyboard offers over two octaves of sound control as a chromatic keyboard or as a predefined scale keyboard with 13 available scales. The built-in arpeggiator with 10 arpeggio modes and a 4-octave range offers even more creative possibilities for keyboardists and non-keyboardists alike.